It may seem a little backwards to jump straight to submitting articles, but once you go through the process you’ll see why this might make more sense. Ezinearticles.com has a one-screen submission form with fields for specific types of data to make your submission complete. How you fill each of these data fields helps determine how well your articles will perform. Because this is a very structured form, it imposes a structural discipline on your article submissions. You’ll need to set up a free account first, but that should only take a minute. Make sure you go back and fill in your profile and upload a photo. You will get a percentage of readers who click through and we should all be pretty adept at creating profiles by now. When you log in, just click the “New Article” icon in the top right of the screen or use the menu Article Manager/Submit a New Article selection and you’ll be at the Article Submission screen. The submission screen has seven fields for you to fill out. From top to bottom, just work your way down. Of course, you’ve probably got the text of your article already written and ready to drop into the appropriate window, but let’s wait until we get there. Subcategory—It’s important to get these right, since a lot of the searches on Ezinearticles.com are done within categories, or by searchers looking for content in specific niches. Here you can see I’m using two categories for all my articles so far. The main category is Writing and Speaking and the subcategory, depending on the article, is either Publishing or Book Marketing. Article Title—(Maximum 100 characters) Articles titles are the single most critical part of your article. There are hundreds or thousands of articles in your niche. Many searchers will see nothing more than your headline. Some copywriters claim to spend more time on the headline for their articles than they spend on the body of the article itself, and I think the evidence of our own behavior, if we observer ourselves, will show that this is a good strategy. If it doesn’t catch you right away, the odds are that you’ll keep scanning for something that does. The best free help I know online is Brian Clark’s 11-lesson tutorial How to Write Magnetic Headlines. I highly recommend it. Abstract/Article Summary/Teaser Copy—(Maximum 200 words) This is the text that shows in Ezinearticles.com’s search results page (SERP). The search here uses Google search technology, and the SERP looks similar to a Google search. What’s odd is that although you are allowed 200 words, the actual search results show varying amounts of copy, from about 140 characters to over 300 characters (200 words would likely be around 900+ characters). Get the most important words at the beginning, including keywords or action words, because that may be all that shows. This copy is second in importance to the headline. If your headline attracts a reader, they may glance at this summary before clicking through to your article. Article body—This is where you’ll copy and paste your article. You have to be careful to get some of the characters like quotation marks correct if you’re copying from Microsoft Word. And I find it easier to paste in unformatted text and format it inside this window. There’s a toolbar with both HTML and WYSIWYG panes to choose from. You can use standard buttons to create numbered lists and bullet lists, and do local formatting like bold and italics. This is also where you’ll find the link tool, which we’ll need later. Author Sig – Resource Box—(Maximum 300 words) This is a big reason we’re doing article marketing, and Ezinearticles.com gives you a massive allowance here. All of this text will appear at the bottom of the article, and you can maintain different signature files for use with different article niches. In the illustration you can see one of my default signatures, complete with two links. More about links later. Creating your resource box is a bit of an art form, and you can keep fine tuning this until you get it just right. As I mentioned, you can also have several different resource boxes which comes in handy if you write articles to more than one niche. Some people think you should write the copy in your resource box as if it’s a continuation of the copy at the end of your article, and they may be right. Perhaps people are more likely to read into the resource box copy that way, but I don’t like that approach. Most people know what a resource box is, but there’s no reason to let this opportunity go to waste. You want to succinctly vouch for your authority on the subject of the article, give some idea of why they would want to click through to your site, and provide the links to do so. Another piece of advice I’ve read about resource boxes relates to the links. Here’s the resource box I’ve been using as an example. Joel Friedlander is the proprietor of Marin Bookworks, a publishing services company in San Rafael, California that has launched many self-publishers. Joel is an award-winning book designer, a self-published author, and blogs about publishing and book design. To learn more about self-publishing a book, book and cover design, and how to make the right decisions when you publish your own book, please visit Joel’s blog at http://www.thebookdesigner.com/ today and join the conversation. Notice I’ve put two different kinds of links in this paragraph. 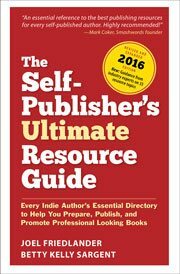 The first uses a keyword I want to emphasize as the anchor text: self-publishing a book and links to a specific article about self-publishing in my archive. The second link shows the full URL of my blog: http://www.thebookdesigner.com/. In the event that the anchor text link becomes disconnected from its underlying URL during its trip around the internet, at least this link will survive as a full web address that an interested reader can follow. From looking over the submission form you can see that these articles are best kept very simple. These articles don’t have much in the way of formatting, because Ezinearticles.com articles are republished on many websites where your formatting might not stay intact. Since the ideal article for this use is 300 – 600 words, it makes it relatively easy to write up 5 or 6 paragraphs on one topic. Then use the tools in the Article Body entry box to add bold to subheads and number and bullet lists, or italics if needed. Note that there’s a helpful video available from the input screen that also walks you through some of the submission steps, and a box with links to information about solving the problem with Microsoft Word Smart Quotes, and a complete set of Editorial Guidelines. Use the Preview Article/Display in New Window button at the bottom when you’re finished to check your work. The preview has the somewhat annoying feature of coloring every contraction in red, but you should read this carefully anyway. When it’s perfect, agree to the Terms and hit Submit. You’ll get a message that your article is headed for moderation, and in a couple of days it will go live right after you receive an email informing you that it’s been accepted. Congratulations! Rinse and repeat 100 times. I’ve decided to insert an additional section in this series, and next time I’ll talk about how to pick subjects for articles, how to incorporate your keywords, and the secret to slipping in that crucial third link that can make all the difference in your article marketing efforts. So stay tuned. Takeaway: The second in a series about how authors can use article marketing, this post describes the submission process at Ezinearticles.com.